We are offering ceiling repair Calgary and surrounding area including Airdrie, Chestemere, Okotoks, Cochcrane, Canmore, Banff and more. 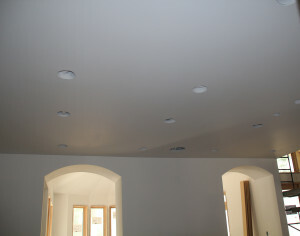 We fix any kind of ceiling damages, like mold, crack, uneven or simply old. Our drywall experts will do the necessary procedure to make sure that your ceiling is fix the proper way and you will always know the total cost before we start. This service is very popular as so many people bought houses with textured ceilings in the Calgary region which they don’t like. Some textured ceiling can be very hard to clean not to mention repairing and painting them which can be even more challenging. Try our full texture removal and smooth ceiling upgrade with our dust reduction technology and a full cleaning service once the job is completed. Texture removal and drywall work in general can be very messy so we make sure to take the extra step to ensure that your house remains clean during the process and we’ll take full care of covering all the floors, furniture and valuables in your house. As always for all our drywall service we like to let our customer chose their quality level. 1- Level 3 is good quality and cost effective. 2- Level 4 quality is very good and for a medium budget. 3-Level 5 quality is outstanding and is for the perfectionist.